Click the picture to play the video of Saraband de Mesangeau by Ennemond Gaultier (c. 1575-1651), played on 11 course French baroque lute played by Ian Pittaway. All of Ennemond Gaultier’s music was published posthumously, so cannot be dated precisely. The medieval European lute is directly descended from the gut-strung Arabian oud. Indeed, the name lute is derived from the Arabic, al ‘ud, meaning the wood. The first evidence of an oud being played in Europe is from the 9th century, with the arrival of Ziryāb from Baghdad, a musician in the service of the Caliph of Córdoba, Spain. Evidence for the oud being played more widely and by Europeans doesn’t appear until the 13th century, in the beautifully decorated book of songs in praise of the Virgin Mary, Cantigas de Santa María, composed 1257–83 in the court of Alfonso X, King of eight regions in modern day Spain and one in Portugal. By some point between 1300 and 1340 the oud had evolved into a distinct western lute. Lutes did not occur in iconography in any numbers, though, until 1380-1400, so we can assume it was little played until then. Like the oud, medieval lutes were played with a quill, which meant that musicians could only play adjacent strings or single lines, which suited the polyphonic, equal-voiced music of the day. 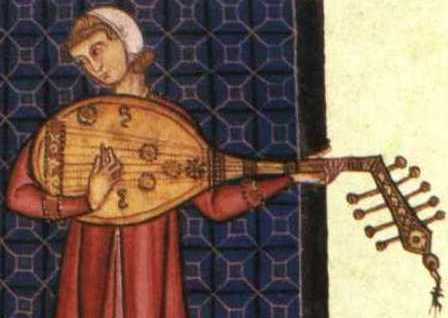 No music survives for the medieval lute, or for virtually any individual medieval instrument. Left: Lute or oud? This is possibly the earliest image of the oud evolving into a distinct European lute, still fretless, from the embroidered Steeple Aston cope, England, c. 1300. Changes happened gradually and there was always variety. As we see in the images below, structural changes were not definitive or wholesale, and evolution would continue throughout the lute’s popular life. 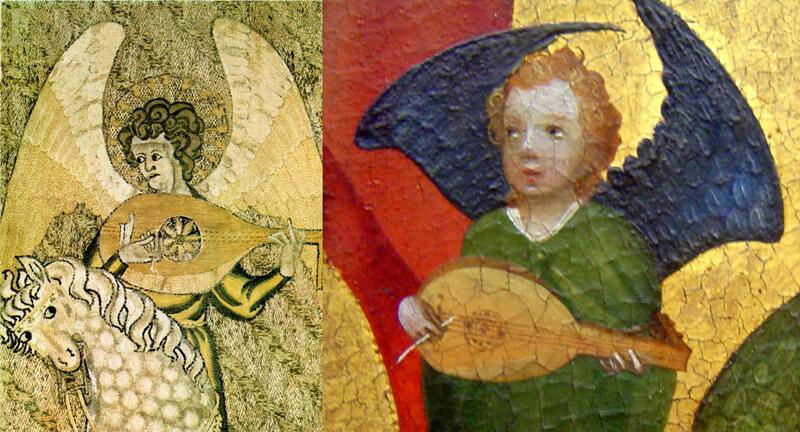 Right: Fretted medieval lute, detail from a painting by the Cologne School, c. 1440. Enter the renaissance, starting in Italy in the 14th century, spreading across Europe in the 15th century. 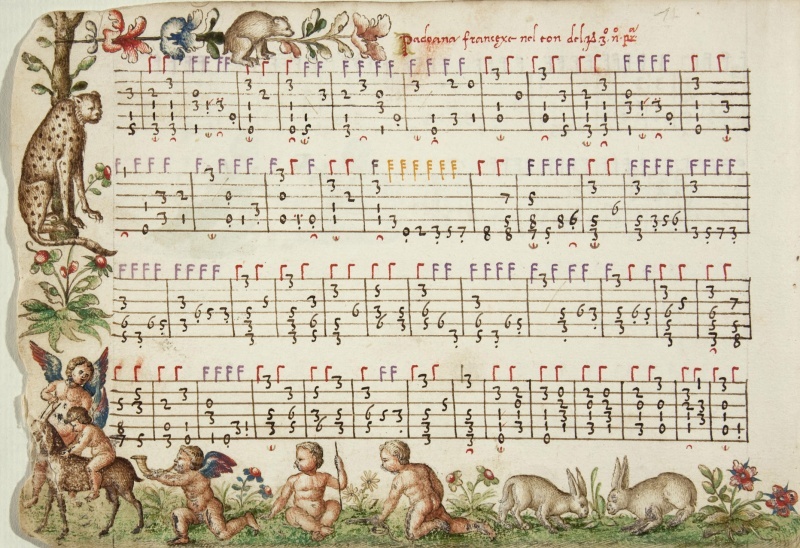 Much music was polyphonic (several parts being sung or played simultaneously) and, in the last quarter of the 15th century, lutenists found a way of playing it solo through the radical idea of putting away their quills and playing with their fingertips. Now single lutenists could play polyphonic counterpoint on their own, using three independent fingers and a thumb on the right hand (presuming a right-handed player, with the little finger anchored on the soundboard). Thus a musical revolution began. The change from quill playing to finger playing came gradually and unevenly, but was eventually universal. Germany as an example, from left to right, in chronological order: finger player, from the housebook of Wolfegg Castle, 1480, anonymous artist; plectrum player in a print by Israhel van Meckenem, c. 1495; finger player in a print by Albrecht Dürer, 1497. Since the finger-plucked lute was now capable of counterpoint and polyphony in a single instrument, it became the most popular and esteemed instrument of the renaissance, associated with heaven, losing oneself in a transport of ecstasy, and the beauty of its gentle voice. A huge range of music could now be played by lutenists, the music saved for posterity by the invention of a new style of notation created in c. 1470: stringed instrument tablature. This is a system indicating which course to play, which fret to play and what rhythm to play, and by this means it is far more specific and instructive for the instrument than the treble or bass clef staff notation most common today. 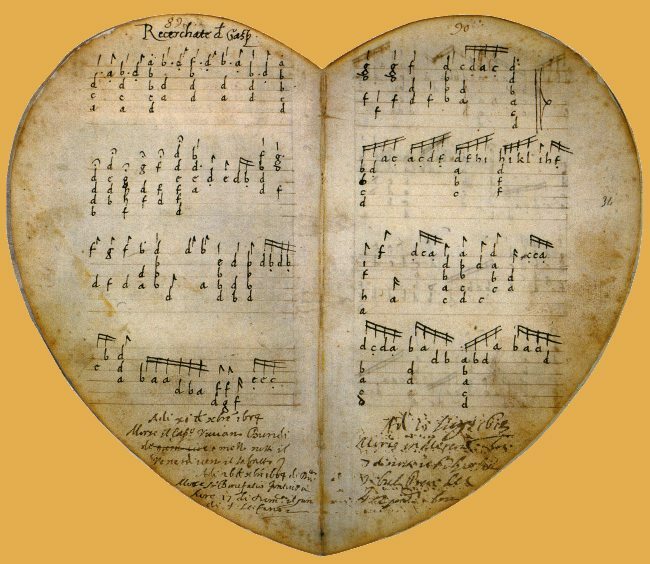 Lute music was written exclusively in tablature in handwritten household books and in print. Three different methods developed. 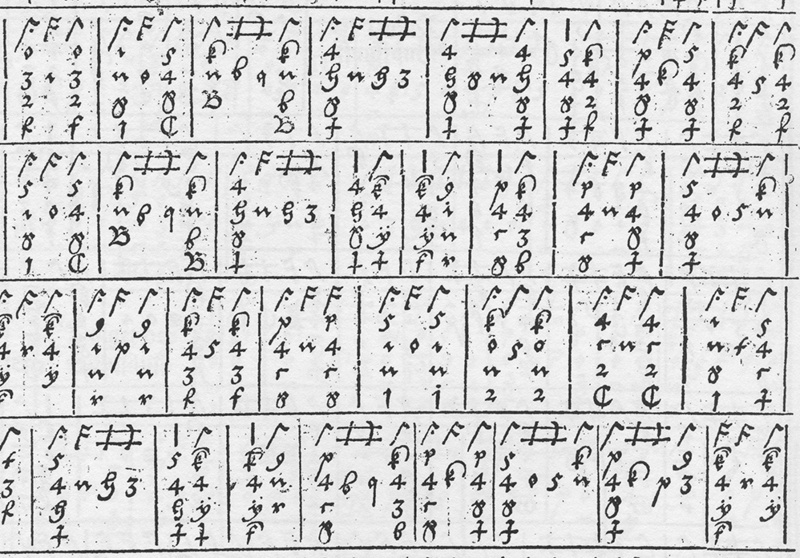 German lute tablature, adapted from organ tablature, was the earliest and most complex system, using numbers to indicate courses and alphabetical letters to indicate fret positions, with rhythm flags above. It remained specific to Germany and German-speaking countries, used from c. 1470 until the early 17th century, when French tablature became favoured. French tablature was used in the French and English speaking world, but paradoxically it was probably created in Italy, as the first evidence for its use is in the Italian Pesaro manuscript of c. 1480s–1511. Six lines represent the six courses, with the first course at the top. (When extra bass courses were later added to the lute, these notes appeared underneath the lines.) Alphabetical letters show you where to place the left hand – a for an open string, b for first fret, c for second fret, and so on – and rhythm flags above the letters show the rhythm for the right hand. Where a note lacks a rhythm flag, you play the last value of note indicated. Extra symbols show ornaments or grace notes and, in some cases, dots under the fret letters show which right hand finger to use – one dot for finger one, two dots for finger two, a vertical stroke for the thumb. Two pages from the heart-shaped Pesaro manuscript, an Italian book of lute music dated c. 1480s–1511, the earliest surviving example of French tablature. Italian tablature appears, from the evidence of the Bologna and Thibault manuscripts, to have developed in Italy contemporaneously with French tablature. French tablature was quickly favoured elsewhere and fell out of favour in Italy, whereas Italian tablature firmly established itself in Italy and Spain. Italian and French tablature work to the same principles, except that in Italian tablature the sixth course is written on the top line down to the first course on the bottom line and, instead of letters for fret positions, there are numbers: 0 for an open course, 1 for the first fret and so on. A page in Italian lute tablature from the beautifully decorated Capirola lute book, written in Venice 1515-1520 by Vitale, a pupil of lutenist Vincenzo Capirola. The lute inspired musical masters to new heights of musical beauty and inventiveness: in Italy, most famously Francesco Canova da Milano, Vincenzo Capirola and Joan Ambrosio Dalza; in Germany, Hans Gerle and father and son Hans and Melchior Neusidler; and in England, father and son John and Robert Johnson, Anthony Holborne and, most esteemed of all, John Dowland. The lute’s wide appeal and versatility is shown in its use in such a wide range of musical styles and playing contexts: solos and duets; song accompaniment; household entertainment; religious and secular music; patronage by royalty; and an integral part of the broken consort, an ensemble of lute, cittern, bandora, bass viol, treble viol or violin, and recorder or flute. Prince’s Mask Tune, possibly by Robert Johnson, c. 1620, played by Ian Pittaway on a 6 course renaissance lute in a’. Part of the renaissance lute’s great appeal is its sound. This is partially achieved by its very light construction; and partially by its style of playing, known as ‘thumb inside’ or ‘thumb under’. The hand is roughly parallel to the strings, not at a right angle, like the modern guitar. The effect is to give a round, mellow sound, as at this angle it is the soft flesh of the fingers making contact with the strings. It also enables great proficiency in fast passages by using a forearm movement, a practice which appears to be directly descended from quill technique, but with the thumb on the downstroke and index finger on the upstroke instead of a plectrum held between the fingers. A portrait by Giulio Campi, possibly of Francesco Canova da Milano (1497–1543), an Italian lutenist revered throughout the renaissance. Note the ‘thumb inside’ hand position, parallel to the strings. Over time, the number of courses (pairs of strings) and the overall range of notes increased: from the medieval 4 courses to 5 in the 1420s, then to the renaissance 6 courses in 1481. Then extra bass courses or diapasons began to be added, making the 7, 8, 9 and eventually 10 course lute by 1600. These extra basses beyond 6 courses were tuned diatonically, i.e. in steps down the scale, and so were meant to be played open rather than fretted. As the number of basses increased, two changes happened. The right hand position altered, moving from a thumb inside to a thumb outside position. While this had been around for some years with a minority of players, the increase in numbers of diapasons made this the widely-favoured position by the 1590s. This shift to thumb outside also reflected a change in musical tastes, as this gave a more trebly sound, perhaps influenced by the pronounced treble timbre of the plucked keyboards, the harpsichord family, which were becoming increasingly popular. 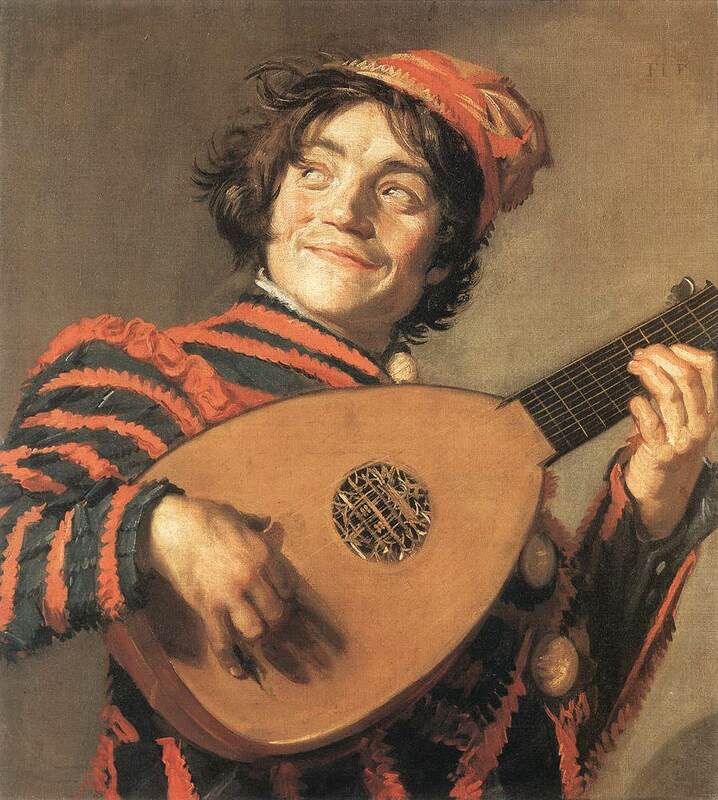 Frans Hals’ painting of 1623, Buffoon playing a lute, is a good illustration of thumb outside technique. 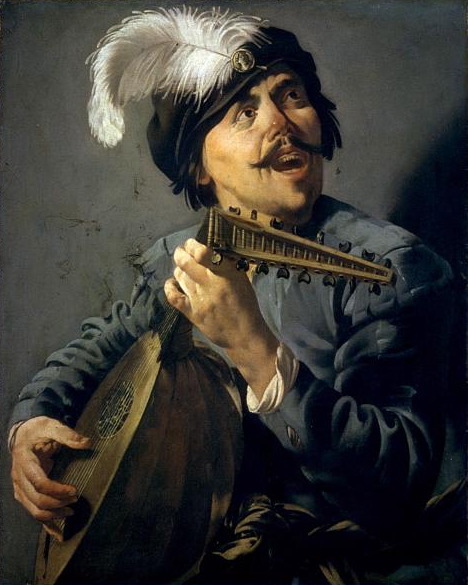 Since the lutenist is still playing a 6 course lute in 1623, more than two decades after 10 course lutes were available, it also shows that not everyone followed the trend for increasing numbers of diapasons or basses. It’s worth stating that players of the renaissance lute today, who have taken great pains to understand and master the thumb inside technique, are delighted by the full, warm, rounded sound it produces and certainly would not agree with Stobaeus’ hyperbole that it “sounds quite rotten and muffled”! The second change or set of changes was structural. In Robert Dowland’s publication of 1610, A Varietie of Lute Lessons, his father John Dowland wrote a section called Other necessary Observations belonging to the lute, in which he commented that “these frets of late years were but seaven in number, as witnesseth Hans Gerle Lutenist, Citizen and Lute-maker of Nurenburge (for so he stileth himselfe in his booke of Tableture, printed 1533.) … Yet presently after there was added an eight fret: for my selfe was borne but thirty yeeres after Hans Gerles booke was printed, and all the Lutes which I can remember used eight frets … some few yeeres after, by the French Nation, the neckes of the Lutes were lengthned, and thereby increased two frets more, so as all those Lutes, which are most received and disired, are of tenne frets”. Other changes had been taking place in Italy before the turn of the century. In c. 1580, the chitarrone was created, distinguished by its extra peg box to facilitate a lower pitch of basses beyond the 6 melody courses. Due to the large size of the chitarrone, the first two courses could not be tuned up to pitch and were therefore tuned down an octave. This may or may not originally have been the same instrument as the theorbo (tiorba) in the same tuning – 16th century writers are confused on the matter – but by 1600 the two names were synonymous. The chitarrone or theorbo was visually similar but distinct from the arciliuto or archlute, designed in 1594 by Alessandro Piccinini. The archlute retained standard lute tuning, and Piccinini recommended that it be played with nails rather than flesh on the right hand, creating a sharper, thinner, more trebly sound. Piccinini stated that the differently-named liuto attiorbato was a misnomer, as the name suggests it is related to the theorbo, whereas it is, he wrote, a synonym for the archlute he invented. Above left: Chitarrone/therobo in The Duet by Jan Molenaer, c. 1630. Above right: Theorbo held by Mary Sidney, Lady Wroth, in a painting attributed to John de Critz, c. 1620. Below left: An experimental archlute, designed in 1594 by Alessandro Piccinini and made by Wendelin Tieffenbruchar. This failed because the basses, being played in the middle of the string length, had a weak sound. Below centre: What the archlute became, as engraved in Marin Mersenne’s Seconde Partie de L’Harmonie Universelle (1637). Below right: Original liuto attiorbato made by Matteo Sellas, 1638, front and back views. During the renaissance and until around 1620, the 6 main melody courses of the lute consistently had a standard tuning, known as viel ton, relatively speaking the same as a modern guitar but with the third course a semitone down. The pitch of a whole instrument depends on its size, from the large bass lute to the small treble lute. The ‘standard’ or most favoured size gave it a pitch of g’ on the top course, a minor third above a modern guitar, giving it a tuning, 1st to 6th, of g’-d’-a-f-c-G.
As John Dowland noted in 1610, changes were afoot in France to enlarge the size of the lute and thus lower its pitch, an idea that was to spread; and, by the 1620s, French, Swiss, Polish and English lutenists were experimenting with different ways of tuning the instrument. By 1650, D minor tuning and its close variants, which first appeared in 1638, had become the norm for French lute players: now the top 6 courses were tuned, 1st to 6th, f’-d’-a-f-d-A. The 4 basses then followed down the diatonic scale: G-F-E-D. When this D minor tuning made playing in some keys awkward, tuning modifications were made to some courses to fit the key. Soon an 11th course of C followed, then up to 13 courses by 1720. The new D minor tuning and overall lower pitch created a completely different instrument to the renaissance lute, with old ways of playing now impossible: a new sonic world had opened up. While Italian lutenists retained viel ton renaissance tuning (and its necessary variant on the theorbo) on their double-headed lutes, French lutenists changed to D minor tuning and retained their single-headed lutes. In this divergence, the centre of the lute world was shifting: the main focus had moved to France. Foremost were Ennemond Gaultier, known as “le vieux Gaultier”, ‘the old Gaultier’ (a piece by whom begins this article, also available here); his cousin, Denis Gaultier; and Charles Mouton. And, since French players had developed this new way of tuning and playing, the D minor lute was called the ‘French lute’ in England. 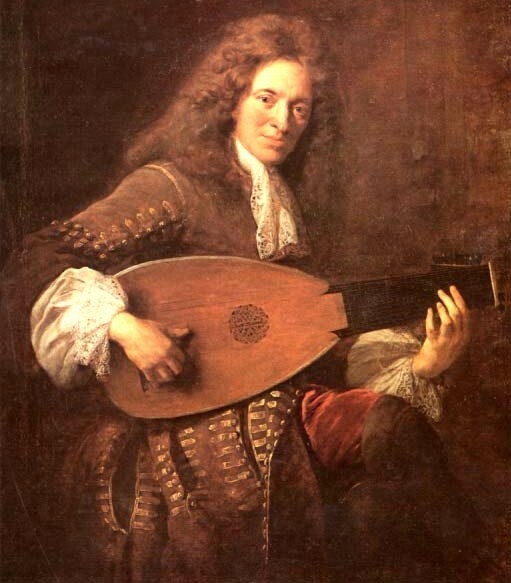 Charles Mouton, c. 1626–1710, one of the influential new wave of French lutenist-composers. French lute style became hugely influential beyond the lute. The style brisé was an arpeggiated way of playing where the tune was deliberately somewhat hidden by breaking up chords into their individual notes. French musicians on other instruments then used the technique, calling it style luthé – lute style. In Scotland, lutenists used the French lute to play French music and, much moreso, traditional Scottish tunes. Thanks to the surviving late 17th century Balcarres lute manuscript, we have some of the earliest versions of these traditional cultural treasures arranged for lute by a variety of Scottish musicians. By the close of the 17th century, the chief focus of lute composition had moved again, now to Austria and Germany, where lutenists were developing a more melodic style which continued to flourish in Germany long after the ‘French lute’ had ceased to be popular in France. German luthiers developed a Germanic version of the French lute and Sylvius Leopold Weiss became its greatest exponent in the 18th century. Weiss’ beautiful and impressive music was the last glorious chapter in the history of the instrument’s cultural significance.